A recent Facebook asked for help finding a cute song for K-3 students. In this article, I’m giving suggestions for easy and cute holiday concert ideas for your primary (PreK-Grade 3) students. If you choose a song that is already familiar to the students it will be quicker and easier to learn. Some of the ones that most will have heard before include those in the K-3 Christmas Concert Idea Book. 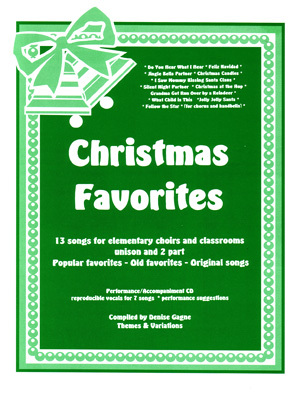 We have nice recordings of ALL of these in K-3 Christmas Concert Ideas. Don’t have time to wait for a book/CD to come by mail? No problem – all of our Christmas collections are available as downloads. In the download you get the pdf file of the book and a folder with all of the MP3s of performance and accompaniment. There are also poems for choral reading, a reader’s theatre of “The Elves and the Shoemaker”, a mini-play, “No Cookies for Santa” a Nativity scene, We Wish You a Merry Christmas, Ribbon dance, finger plays, and more! This is a great deal – $18 download for the whole collection — many single song kits are $15 for one song. * Do You Hear What I Hear? This is a collection of lessons and activities based on nine familiar Christmas carols. Each song is notated for vocals, soprano recorder in two parts, Boomwhackers in two parts, a variety of percussion instruments, and with chords provided for ukulele (or guitar). All parts can be used together and also work in any combination. Each song comes with a vocal track and an orchestrated accompaniment track. A slower accompaniment track is given for Boomwhacker play alongs. Reproducible and Projectable lyrics are included so the songs could be used in a performance or a school holiday sing along. The activities include naming notes, writing notes, recognizing rhythms, creating new melodies, as well as fun games and word puzzles based on the lyrics of the carols and the song information. Themes & Variations publishes many more Holiday and Christmas collections and there are many holiday songs in the Musicplay PreK – Grade 6 curriculum. Visit http://musicplay.ca/ to see our complete Christmas section. This entry was posted in Holiday Concerts, Uncategorized and tagged Christmas Concert, Christmas Concert Ideas, Denise Gagne, HOliday concerts, K-3 Christmas Concert Ideas, Musicplay on November 12, 2017 by Denise Gagne.